The great Philip José Farmer was the master of grand concepts – story ideas based with unique original settings, such as Riverworld, which features a strange physical afterlife into which all the humans who ever lived are reincarnated. One of his lesser-known works is a blending of historical and far future concepts: his 1971 novel The Wind Whales of Ishmael. Originally published by Ace Books and tragically out of print, it was re-released in 2013 by Titan Books. The story begins where the classic Melville novel ends, with Ishmael floating in the ocean as the sole survivor of Ahab’s ship the Pequod. After he is taken aboard the Rachel, he and his rescuers encounter terrifying monsters and a mysterious electrical storm followed by the sudden disappearance of the sea. The ship lurches violently and Ishmael is thrown off the deck. He is once again alone, this time plummeting through the air. On the way down, he encounters mysterious floating structures which slow his fall, finally plunging into a small and lifeless sea below. He swims to shore, he encounters a fantastic landscape filled with carnivorous plants and mysterious beasts that float in the air – including the wind whales, with their lighter-than-air flotation bladders. After several life-threatening encounters, he meets a young woman in primitive garb who speaks a totally unfamiliar language. Eventually, he realizes that he has been hurled far into the future, and will never see his native New England again. He steels himself to survive in this strange new world, learning the woman’s language and eventually using his knowledge of nineteenth-century technology to help her tribe. I found the book’s premise to be refreshingly original and intriguing in Farmer’s inimitable way. It differed from its literary inspiration in a number of ways. First of all, it’s told in third person. Secondly, it’s a short book, both fast-paced and concise. Thirdly, it lacks the poetic imagery of Melville’s masterpiece. Finally, this far-future Ishmael is no longer a romantic; he’s an eminently practical man. This is believable in the sense that he must struggle for survival. In this completely alien world, where everyone and everything he valued is gone, his Presbyterian beliefs would make little sense. I must admit that Farmer’s use of Ishmael as the protagonist is an arbitrary device, though the wind whales concept does tie it in somewhat. I enjoyed the book in its own right, though it suffers from the same faults as many science fiction novels of its era: occasional excesses of exposition and characters who are less than fully realized. 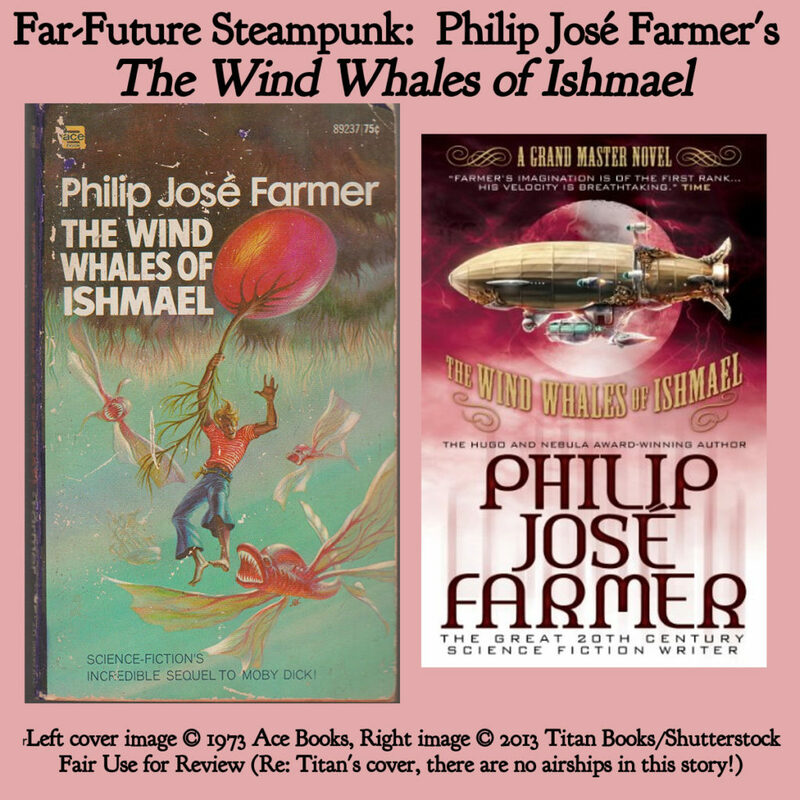 I recommend The Wind Whales of Ishmael to anyone who enjoys science fiction with an old-timey adventure-driven feel to it. It may not be steampunk in the classic sense, but I’m certain that many steampunk fans will enjoy it nevertheless. I loved it for the imaginative concept, the tenuous tie-in to Melville’s classic, and most of all its incredible world building. It can be a bit dry at times, but it’s a quick read nonetheless. I give it a rating of four out of five gears.